Practice: how much does a Lizard canary drink? How much does a Lizard canary drink? A silly question? We all know that it is not much. We fill the drinkers in morning, and by the evening the level has dropped, but there is usually plenty left. I was curious, but an internet search came up with only a single result for canaries. It was so vague that I regarded it as almost worthless (1). I decided to carry out my own experiment. Note: if you don’t want to wade through the experimental protocols you can scroll down to the conclusion and the caveat. I selected two flight cages, each containing 6 Lizard hens after the breeding season. Each cage had two tubular drinkers which I cleaned and replenished twice a day. I filled the drinkers with 60mls of water, and weighed them before fitting them on the cage fronts at around 8.00am. I weighed them again before replenishing them at around 6.00pm, which is my normal practice. The experimental period averaged 10 hours each day. I used the same routine on a ‘control’ drinker which was not fitted to the cage fronts because I wanted to assess whether water loss through evaporation was a significant factor. Weight loss varied from 21 to 32 grammes per cage. Evaporation loss averaged 1.5 grammes per drinker. Average water consumption = 23 grammes per cage = 4 grammes per bird approx. Remember, these figures are for a ten hour period. Assuming that the birds were active from dawn to dusk, they could have consumed water over a period of 18 hours 12 minutes (2). 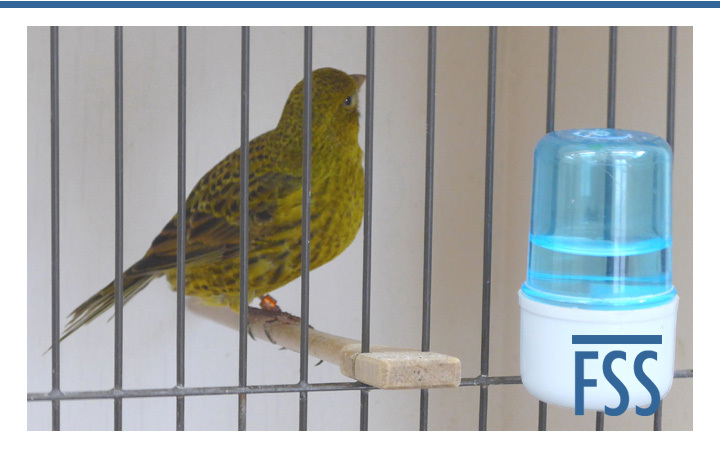 To obtain a daily consumption rate, the above figures therefore need to be increased by 82%, giving an average consumption of just over 7 grammes per Lizard canary per day (3) with a variation of +/- 2 grammes per bird per day (4). As 1 gramme water (by weight) = 1 millilitre water (by volume), water consumption can be summarised as 7 mls +/- 2 mls per Lizard canary per day. The figures are valid only for the conditions in my birdhouse, which is insulated and shaded, and rarely suffers from extreme weather conditions. The conditions in your bird house will probably be different. I recommend you carry out a similar experiment to establish the water consumption of your birds. The only time that it might be critical is when if you are giving your birds medication. The recommended dosage of some products is based on X grammes per kilo weight of the bird(s). Assuming that the product is administered in the drinking water, you need to know a) how much the birds weigh and b) how much water the birds will drink before you can calculate how much product to add to the water (5). The same applies to supplements, although the need to give them to your birds is more debatable. Pharmaceuticals and supplements can be expensive; they can also be dangerous if given in excess, and potentially harmful to the environment when they are flushed down the drain. Provided our birds have enough to drink, precise dosing helps to minimise all three of these drawbacks. Do we really need to fill a 60cc drinker when half that will be more than enough? According to the Lady Gouldian website, canaries drink anything from ‘1/4 oz to 2 oz of water per day depending on variety and size’ (1 oz (ounce) = 29.5 mls). This seems an extraordinary variation, and implies that some canaries drink more than their own weight in water each day. The more plausible explanation is that some birds were bathing in the drinking water. The duration from dusk to dawn includes usable light before the sun rises and after it sets. The figures assume that water consumption is consistent during the hours of daylight. In practice, it may be greater or less at dawn and at dusk. I didn’t measure it. An average consumption of 7 grammes is quite close to Lady Gouldian’s lowest figure of ¼ oz (ounce) per day. The drinkers were weighed on domestic digital scales, not laboratory scales. Due to the limited accuracy of my measurements, I have rounded all figures up to the nearest whole gramme. I will give the answer to question a) in a later article.